I am hiring all of the fairy lights from All About Me, but I am getting help from friends and family to make my own bunting and globes. Sam also has this ambitious idea to crate a centre piece made out of balloons and string! Sounds strange but he assures me it will look amazing. I will make sure I post photos here so that you can see the end result for yourselves and make your own judgement. Samantha at All About Me has started a Pinterest wedding board and I think that this ‘creation’ is on there. There are also loads of other cool ideas for decorating, most of which can be done on a budget. So that is this weeks mission. Every decoration can be prepared and flat packed so that it doesn’t take up too much room. And the Tipi team have given us plenty of time to be able to get into the tipis before the wedding to be able to decorate everything. They also provide all of our lighting and rig it all up, so we don’t have to worry about that side of things at all. Now we just have to think about table decorations. We aren’t doing traditional wedding favours, but a friend of mine is supposed to be brewing some sloe gin as we speak, so we may use that depending on how it turns out! We are thinking of using lots of tea lights, some origami flower centre pieces. We won’t need table place settings either as the meal is a hog roast. The tipi company are providing us with a separate catering tent so that all the food prep and any food storage can be kept separately. It really feels like this wedding is starting to come together. But we still haven’t sent the invites!! At this rate, we will have an amazing wedding but no guests. Shouldn’t make jokes like that really. Not so sure why sending invites is so difficult. Did anyone else have this problem?????? My Wedding Story – Part 2 – 12 weeks to go! Now there is less than three months until our wedding I am starting to get a bit stressed. To follow on from my blog post last week, we have left things until quite late on to get organised. So this past week, we have managed to send our ‘Save the Dates’. As a money saver and also because I am a bit of a geek we decided to send these by email. We are also sending the actual invitations by email too. I have just thought of a million other things whilst writing that list, but for fear of overwhelming myself, I might just try and concentrate on one small bunch of jobs at a time. Luckily Samantha at All About Me has put me in touch with a great DJ and the perfect choice to provide our bar. Paul runs a company called Double Decker Bar – www.doubledeckerbar.com and will bring along all of the required drinks for the reception. We have met with him and he is happy to provide pretty much whatever drinks we request and he also provides the glasses and all of the staff. He even has wireless card payment facilities which is a huge bonus. As we are in the middle of a field I was worried I would have to ask everyone to bring cash with them, but Paul has assured us that he is happy to take card payments. Yay! Oh and we aren’t actually expecting people to go out to the Bus to get their drinks. As it may well be quite chilly on the day, Paul is bringing the bar inside the tipis. Anyone who is brave enough to go on the bus is welcome to do so as it will be parked just outside. As for the DJ, we have chosen a very smart looking bloke called Andy Murphy. www.andymurphydj.co.uk. Again he comes highly recommended by All About Me and has worked with them on several occasions so he is the perfect choice for a DJ who knows the acoustic requirements of a tipi. We have got to get our music choices to him soon, but again, he seems really relaxed and flexible. The toilet hire and generator have come from the same place at www.blueloos.com. They were really quick at getting back to us and Donna from their team has been really helpful in helping us to understand what we will need. Ok, so I am not sure how to start this. All About Me asked if I would be interested in writing a guest blog about my experiences of organising a wedding. Of course I said yes. What bride wouldn’t want to talk about her own wedding? And plus I guess it is a sort of stress therapy sharing all of my experiences with you all whether you are a Bride, Groom or Event Organiser, I hope you can gain some amount of amusement, useful information or ‘what not to do’ from my Blogs. So I will start with a bit of background information. I am marrying my best friend Sam Mallows. We had our gorgeous baby boy Austen last October and Sam proposed to me shortly after we brought our little bundle of joy home for the first time. The past year has been a bit of a roller coaster ride for us and our families. When I was 7 months pregnant with Austen I discovered that I had a brain tumour. My surgery was set for 5 months after I gave birth, so on Mothers Day this year, I went into hospital for my first craniotomy. Thankfully my brain tumour was benign and easily removed, so we continued with our wedding preparations shortly after I got out of hospital. However everything took a bit of a turn for the worse when I got a brain infection, then had a seizure and various other post-op complications that I won’t bore you with now. Anyway, the point is, the wedding preparations have taken a bit of a back seat, and now I am on the road to recovery again, I am full steam ahead. The only thing that we managed to get organised before I went in for my operation was the venue. There was not really any question about this. Both Sam and I wanted a bit of an alternative wedding. neither of us are very traditional, and we don’t particularly relish the idea of having the spotlight turned on us for the whole day. So what better way to divert attention than making the wedding venue breathtaking! Yes we could have gone down the hotel route. There are plenty of perfectly lovely hotels and wedding venues in Cheshire to choose from. 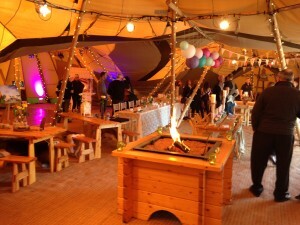 However, we had seen pictures of Tipi weddings before and both of us absolutely loved the idea. We headed to an Open Day at Chester Lakes in Doddleston where All About Me, Marquees and Events were showcasing their Giant Hat Tipis. They had the tents decorated with thousands of fairy lights, really pretty bunting, a dance floor, wooden benches and tables, tea lights, fire pits, a chill out lounge and a bar. It was everything we could have asked for. The fire pit just sealed the deal for me. We had decided on having a winter wedding but I was concerned that it would be a bit chilly in a tent in the middle of a field. But there were heaters and the fire pits gave the tents a lovely cosy, homely feel. A massive plus point for us was the the All About Me Team were there and answered every question that we had. Sam, James, Dave and Andy were all so easy to talk to, and Austen also gave them his seal of approval which made our minds up for us. They checked their availability and we booked our wedding for November 8th. They can put up the tipis pretty much anywhere we want, but Chester Lakes seemed like the perfect location for us. Just outside of Chester, with lots of hotels nearby for guests to stay in. So now we have a venue, and a date. We just need to organise food, music, invitations, decorations, the ceremony, dresses……………………and we only have 13 weeks left!!! We must be mad. Thankfully Samantha from All About Me is proving to be my lifeline. Will let you know how much progress we have made next week…. We are so excitedly chuffed to tell you about our new collaboration with The Success Factory. This brilliant training and conference venue is just beautiful and we are really looking forward to putting up our tipis there in the near future. The Success Factory is based in Burwardsley, in the heart of the Cheshire countryside, but just 15 minutes away from Chester. It is perfectly located for all team building events, conferences, meetings and lots more. We hope that our tents will add another dimension to this venue and make everyones experience with the Success Factory, that little bit more special. Welcome to our first Guest Blogger Kate Spratley – Soon to be Kate Mallows. 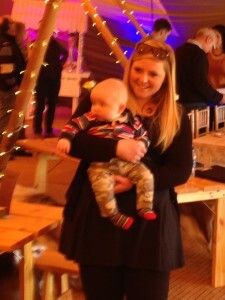 Kate’s wedding is on November 8th 2014, and she is offering All About Me her own personal experiences of organising a wedding and getting married in a giant tipi! Over the next few weeks, Kate will be giving you her story in her own words, about every step of planning her wedding from finding a venue to booking a DJ, decorations, invitations, and most interesting of all, her traumatic year which culminates in the wedding celebrations on November 8th. We promise you it is certainly quite a story so far, and expect it will be an interesting read from this point on. If you want to share your wedding with us and provide valuable experience to some brides or grooms out there, feel free to contact us about submitting your story. In the meantime, keep checking back here for the first insight into Kate’s wedding preparations. Two weddings and an award! What a great week for the All About Me team. We have been presented with a Mini Tablet for being the ‘Most Supportive Customer’ from J and J Carter. 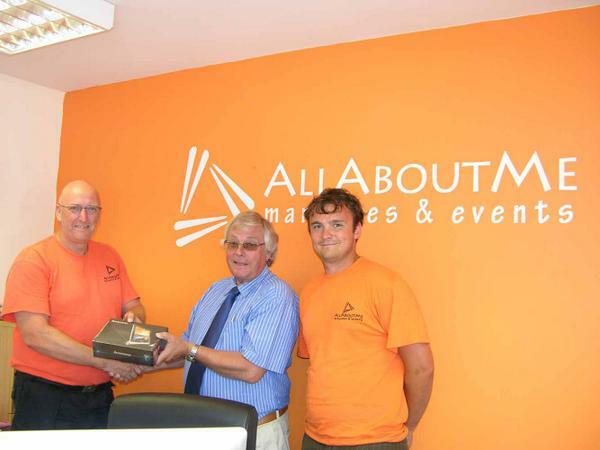 J and J Carter supply us with our fabulous catering tents, and Alan from their Hampshire based Fabric Architecture Company presented Dave and James with their cool new office equipment this week. So to finish off our exciting week, we are putting up Tipis for weddings in Little Budworth and Powys. Happy wedding weekend to both couples. But watch out on Sunday when our team come to do the takedowns. Its a full moon on Sunday and our MD Jamie has been known to turn a bit wild!